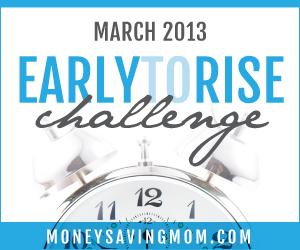 This is Day 15 of the Money Saving Mom Early To Rise Challenge! Today is the halfway point of the challenge. I'm kinda surprised that I'm still in the game, to be honest. I thought I would have long given up by now, but I'm still here. It seems my motivation is also gaining momentum, whether from the idea that I'm still doing this or from the results of getting up early I don't know. Guess it doesn't matter either way, as long as I'm getting up. Really though, I'm learning to love my early mornings and the quiet time I get to have before the day starts. Day 15 spoke about how our past does not dictate our future. Obviously, I've not been able to stick with the challenge spot on. It's almost halfway into April for heaven's sake and I'm still doing this. But I know that sticking with my goal to get through weekdays of rising early is going to change my whole perspective and ability to do this for a majority of the time from now on. I don't know that I'll do this forever, but for this season in my life, however long it may last, I know rising early works. But on the other hand, giving myself grace is not only necessary but essential to being motivated to do this until the challenge ends and then keeping it consistent. 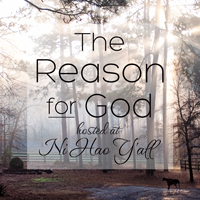 I tend to be an "all or nothing" kind of person when it comes to things like this (Type A, right?). So without the grace I constantly need to remember to give to myself, I would just throw this whole challenge out the window, likely with first day I failed. I did change my rise time by half an hour, so now instead of 5:30 am I wake up at 5 am. I was just feeling so rushed and not relaxed at all when I woke up and that's not how this is supposed to go. Apparently I need a full hour and a half before any of my kids wake up for the day. So, what time did I get up today? The alarm went off at 5 and I got out of bed at 5:03 am! Woot! Success!